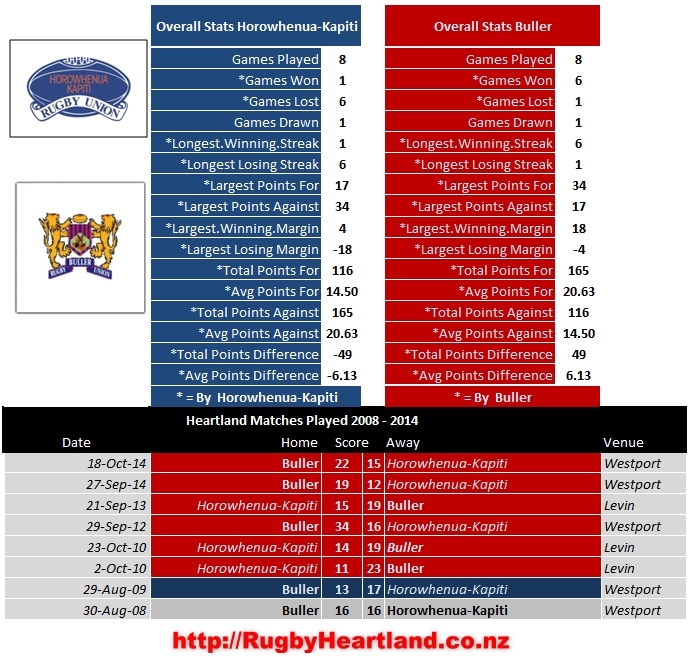 Mid Canterbury’s self implosion last week has opened up the top of the table with neighbours South Canterbury taking advantage and top spot on the table as we enter the final round of the 2015 Heartland Championship and the final chance for teams to secure those all important Meads Cup Semi Final positions. South Canterbury , Mid Canterbury and Wanganui have secured three of the four places available but the question remains who will get hometown advantage as the top two sides get to host Semi Final #1 and #2 , and who will snare the final 4th spot ? . To add to the drama though for the final round we also watch with interest to who will make the Lochore Cup Semi finals for teams finishing 5th through 8th. Those finishing 5th and 6th get to host the Semi Finals for the Lochore Cup and the lineup is far from set here. 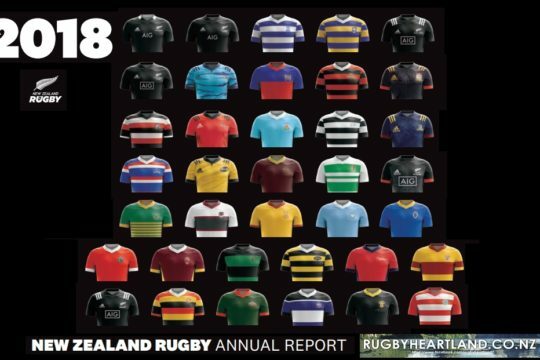 With Wairarapa-Bush (still in Meads cup contention) , Horowhenua-Kapiti (still in Meads cup contention) , North Otago (still in Meads cup contention – just) , King Country , Buller , West Coast and even Thames Valley all have the ability depending on results to be at the business end of the competition. Wairarapa-Bush vs Wanganui is our main match of the Round though , after 115 years , these two sides first met in 1890 (as Wairarapa ) and 1897 ( as Bush ) where they played 50 a total of 50 games as individual unions then since Bush and Wairarapa merged in 1971 they have since met 40 times. 90 matches over 115 years and we Wanganui lead with an average score of only 15.60 vs 14.13 and this weekend a Meads Cup Semi Final on offer a huge match is expected. 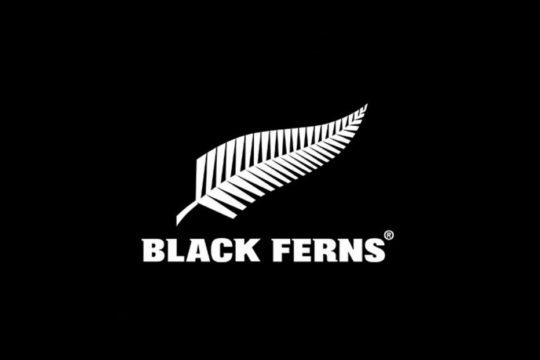 Wanganui will be looking for a record equaling 7th straight victory over the boys from the Bush and the possibility Home Semi Final , while Wairarapa-Bush will be hoping for a victory to get them into Meads Cup contention. Though a lose would not be the end all for them , as a consolation for them would be a Home Semi Final in the Lochore Cup , albeit though the Meads cup is where they do want to be. 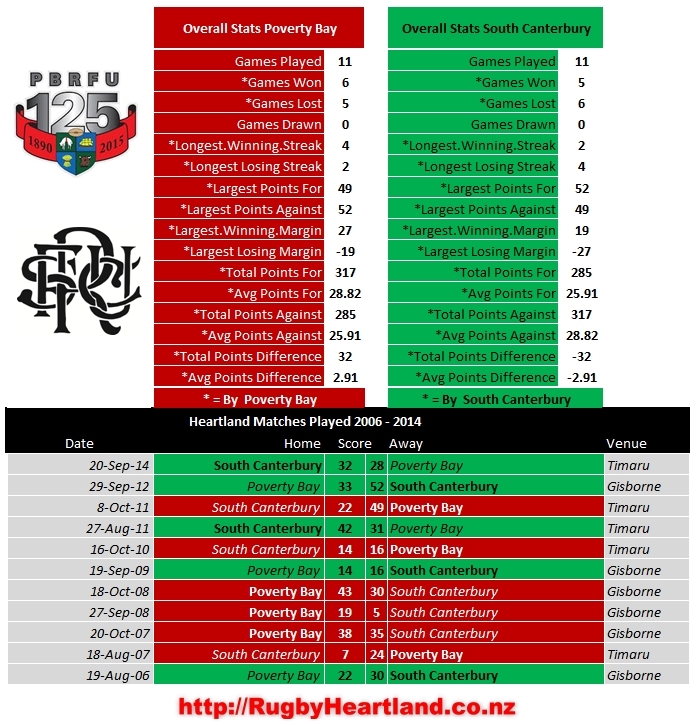 The only certainty is that Poverty Bay and East Coast will end the season out of contention , but Poverty Bay will be hoping to upset the apple cart by ending their 125 years celebrations with a home victory over leaders South Canterbury and a loss by Thames Valley to West Coast could see them finish 1oth for 2015. East Coast on the other hand have had another season of disappointment but the signs are there that the mixture of experienced players and new players have learned a lot from the season and that in 2016 there is only one way to go and that is up … in saying that , they have one last opportunity in 2015 and it is the final game of the round , and the second night game of the season , when they take on King Country under lights at Taupo from 7.30pm. 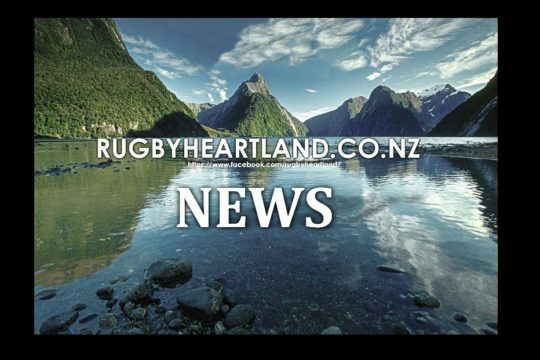 King Country Rams will be hoping for a convincing performance to secure themselves a Lochore Cup Semi Final and a Bonus Point win could land them a home Semi Final, that is if North Otago fall against Mid Canterbury. 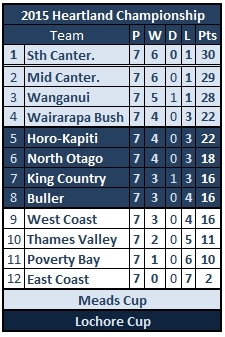 The Permutation’s for this round though abound with many endings here we see what points the teams could end on ..
Horowhenua-Kapiti could get a Meads Cup Semi Final with a win over Buller, only if Wairarapa-Bush lose to Wanganui outright. 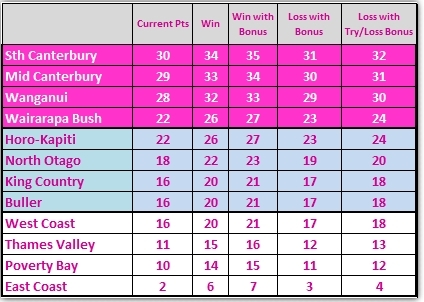 If North Otago win with a try Bonus Point and Wairarapa-Bush and Horowhenua-Kapiti both lose with Bonus points then North Otago will finish fourth. 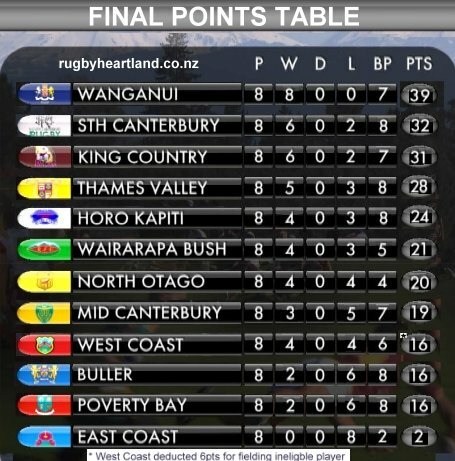 If North Otago lose they will host a Lochore Cup Semi Final unless they lose without a bonus point , then King Country , Buller , West Coast win with Bonus points could knock them back to an away Semi Final. 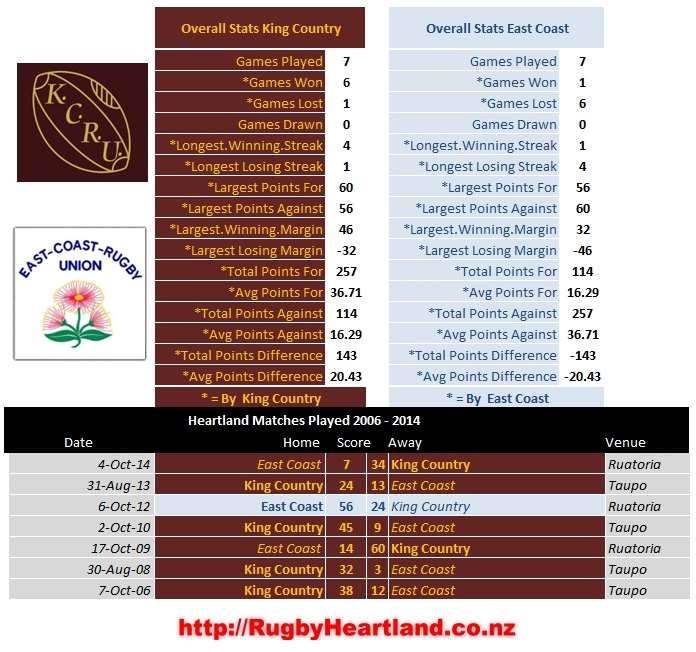 If King Country Win with Bonus Point they will host a Semi Final unless North Otago win. 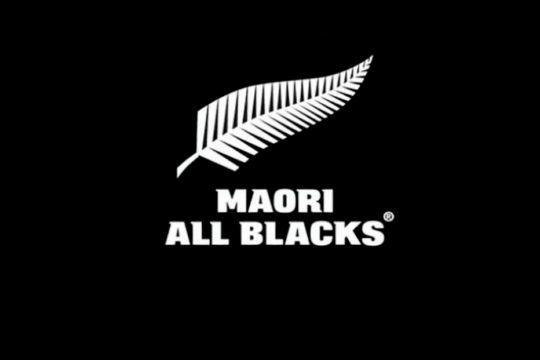 If Buller win over Horowhenua-Kapiti they will need at least a bonus point to secure a Lochore Cup Semi Final if West Coast Win without Bonus Point. If West Coast Win , they need to win by more than 13 points to overtake Buller On Differential if King Country , and Buller finish on the Same Points , otherwise if Buller and West Coast finish equal , then West Coast will make the Semi Finals on the back of their regular season victory over Buller , if 3 teams finish on equal points then it is differential that sorts out the places. 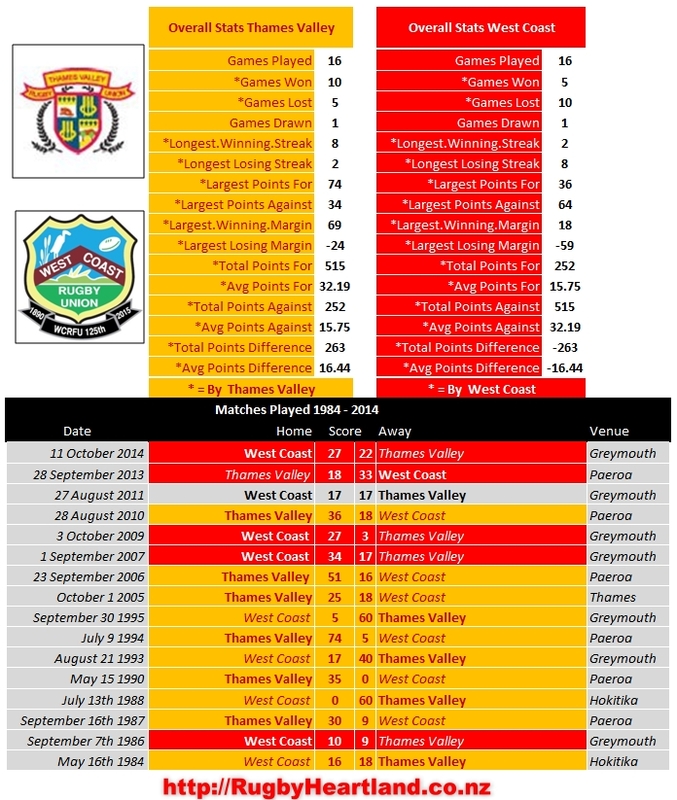 Thames Valley’s slim chance of a place is a Bonus Point Victory with King Country , Buller and West Coast all losing with no Bonus points and a victory of 60 points or more over West Coast. i. The winner of any Round Robin match played between the two Provincial Unions in that year will have the higher position. i. The Provincial Union that scored the most tries in the Round Robin shall have the higher position. ii. The Provincial Union that scored the most points in the Round Robin shall have the higher position. iii. The toss of a coin will be used. We begin our head to head match-ups with Wairarapa Bush vs Wanganui , these two sides first met in 1890 (as Wairarapa ) and 1897 ( as Bush ) where they played 50 a total of 50 games as individual unions then since Bush and Wairarapa merged in 1971 they have since met 40 times. 90 matches over 115 years and we Wanganui lead with an average score of only 15.60 vs 14.13 and this weekend a Meads Cup Semi Final on offer a huge match is expected. 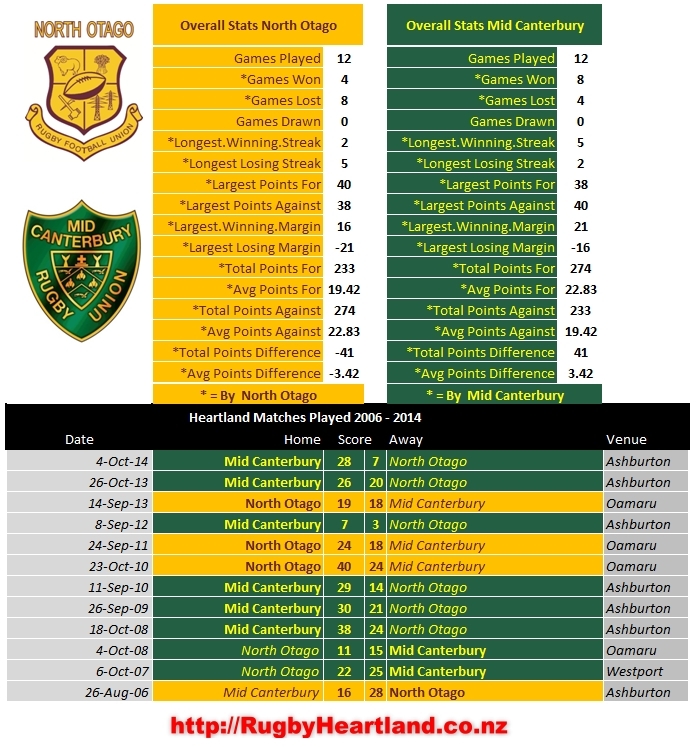 Detailed Head to Head’s continued ….